Refs 1-54 and 1966 World Cup. 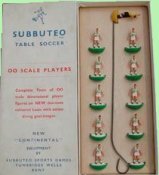 Clearly one of the key developments in Subbuteo history (and for table soccer in general) was the introduction of 3-D OO scale footballers in place of the flat card (or celluloid) figures. These new figures first arrived in the 1961-62 catalogue. I believe the sets were rushed out for Christmas 1961, with the individual teams arriving a few months later. These new figures were more realistic and more colourful than the earlier figures, and were clearly more attractive to the youth market. In addition, unlike the celluloid flat sides, these teams were sold complete in attractive and practical boxes. 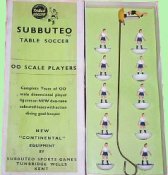 Another boon for Subbuteo Sports Games was the 1966 World Cup. Footy fever swept the country and Subbuteo's legendary status was assured. Mind you, this change in player type wasn't without its detractors. The new figures did not have the delicate balance (and therefore touch and control) of the flat teams. Although the bigger bases pack a decent shot and are better at traveling in straight lines, overall the player is not as good. This meant that the old timers and more serious adult players stuck to the original flat game, while the new OO version was adopted by kids everywhere. This first heavyweight casting is not a particularly attractive one, although it has some period charm. The player is wearing a short sleeved shirt with a v-neck, both of which are usually highlighted in the painting (although not always). There isn't a lot of detail, and the pose is still a bit flat when viewed from the side. The player's arms are rather thin, and the left hand is often missing. Although all this was probably due to casting limitations at the time. Box 1. Box 2. Box 3. Box 1: White Box - This is the original box, and only had a very short period of production. A number of Subbuteo histories have dated this to 1959, but that makes no sense if the arrival of OO scale teams is 1962. Box 2: - The first green box (although the green is restricted to a panel on the lid and the insert). This box shows the new improved logo, but the layout of the writing remains the same as the previous box. The white, printed top layer is stuck onto a thick rough card box, which is lacking in flaps. The white layer (plus corner strengthening tape) holds the box together. Box 3: - The layout of the box top was redesigned, and the box was printed onto a better quality card. The lids have flaps that are stapled. The staples can be horizontal or vertical, and there can be two or four staples to each end. There are also variations in the green colour of the box. This box lasted into the classic h/w era, and the final versions of this box have folded ends, and no staples. For this page, the team names up to reference 40 come from the 1963-64 catalogue. After ref 40 I've quoted the year of introduction and the name of the original team (as I've done with the flat team page). With the new improved heavyweight arriving in 1967, it was thought that the teams of that vintage (i.e. refs 51 and 52) were the last ones to be produced in the short-sleeved figure. However, a reference 54 Plymouth from 1968 recently passed through ebay, and seemed to be a genuine side. So at present, this is the limit of this list. A Subbuteo dealer has also mentioned having a white 54 Plymouth in this figure that he thought looked okay, but further proof is awaited. The white version comes from 1970, which would seem much too late a date, but this outfit does exist as a celluloid figure, so maybe it is earlier than the catalogues suggest. Of course, Subbuteo production is haphazard, and a batch of the old figure could've been found and used up later than the rest. Then again, a white 54 would be easy enough to paint onto a plain reference 21. Birmingham, Cardiff, Chesterfield, Chelsea, Everton, Gillingham, Halifax, Leyton Orient, Leicester, Portsmouth, Shrewsbury Town Scottish Sides: Albion Rovers, Cowdenbeath, Dundee, Glasgow Rangers, Raith Rovers, St. Johnstone, Queen of the South. International Colours: Scotland, Italy, France. Brighton & Hove Albion, Bristol Rovers, Huddersfield, Southend, West Bromwich. Mansfield Town, Newport County, Oxford Utd. Torquay, Southport, Watford, Wolves. The illustrated example is clearly Subbuteo Old Gold, but the team is advertised as "old gold (or yellow) (or amber)", so variations might exist. Newcastle Utd, Scottish sides: Dunfermline. Brentford, Lincoln City, Sheffield Utd, Southampton. Alternate ref 18 with long sleeves. Carlisle, Millwall, Reading, Queen's Park Rangers. Scottish Sides: Kilmarnock, Morton. Also Racing Club de Paris. Nobody was on this number in 1963-64 It is usually Bristol Rovers. Plymouth Argyle. Scottish Sides: Hibernian. International Colours: Eire, Southern Rhodesia. Arsenal. Scottish Sides: Stirling Albion. Barrow, Bolton W, Bury, Scunthorpe, Tottenham H, Preston N.E. Long sleeved version also spotted. The original version of this number was Bradford (Park Avenue). This version had red, Amber and black hooped shirts, and white shorts. However, this figure was replaced in the catalogue that introduced the OO scale figures, and has not been seen in OO scale to my knowledge. The kit had not been used for a number of years, and it seems likely that it was replaced in the new range for that reason. Why produce an obsolete kit in the new figures? Bradford, Swansea Town, Tranmere, Leeds Utd.Scottish Sides: Airdrie. Also Real Madrid and Red Banner. Colchester, Chester, Sheffield Wednesday, Hartlepool. A rare spell of being busy for ref 22. Although claret and amber in the catalogues, the old heavyweight is usually painted in red and yellow. As with many of these sides, this has also been seen with hooped socks. I've also seen this side with green sock trim. ...and green socks with white trim. Has also been seen with hooped socks. Northampton Town. Scottish Sides: Hearts, Arbroath, and Stenhousemuir. International side: Hungary. Norwich City. This is the original version of Norwich and has black shorts. International side: Sweden. Hull City, Port Vale. Scottish Sides: East Fife. Original black shorts version of ref 40. Variation: Has been seen on both white and flesh plastic. Was blank in 1963-64 (previously another version of Bradford Park Avenue). First Version. Introduced 1963 - Crystal Palace. Black Shorts. Third Version. Introduced 1968 - Crystal Palace. Claret and light blue stripes, white shorts. Probably too late for this figure, but if the 1968 Plymouth exists, then this one might as well. Introduced 1965 - Liverpool, Bristol City, Workington, Crewe. Introduced 1965 - Chelsea, Carlisle Utd, Cardiff, Shrewsbury, Bristol Rovers, Ipswich, Stockport, Birmingham. This team is usually painted with long sleeves rather than the usual short variety. However, a v-necked short sleeved one is now also illustrated. Also seen with white socks, with green trim. Introduced 1966 - Wolves, Southport. Second Version: I think the orange/tangerine version was probably too late in date for this figure. Introduced 1968 - Portsmouth. Not yet seen as an old heavyweight. First Version. Introduced 1968 - Plymouth - green version. Second Version. Introduced 1969 - Plymouth - white version. The green team here might be a repaint - it is a little glossy for my liking, but this kit has been seen by reliable sources. Reference 50 was also introduced in 1966. I've never seen a team with the white stripes on the shorts. blue shirts, white shorts, red socks. Blue shirts, white shorts, blue socks with white top. Green shirts, white shorts, green socks. White shirts, blue shorts, blue socks with white top. Red shirts, white shorts, red socks. Identical to the later version of reference 1. Reference 48 arrived in 1965 and lacks only the yellow on the socks. Probably the same team. Identical to the original reference 1.